Used for the relief of post-traumatic inflammation of tendons, ligaments, muscles and joints due to sprains, strains, and bruises. Also for the relief of localised form of soft-tissue rheumatism and degenerative rheumatism. Adults: Apply and rub gently on the affected are 3-4 times a day. For external use only. Should be applied only to healthy and intact skin surfaces (those without open wounds or injuries). It should not be allowed to come into contact with eyes or with mucous membranes. May cause application site reactions including rash, eczema, dermatitis, and skin redness. 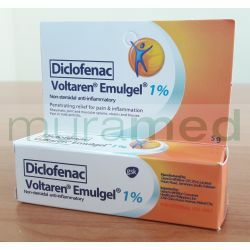 This product should not be used in patients who are allergic to diclofenac, aspirin, other NSAIDs/ nonsteroidal anti-inflammatory drugs, or to any of Voltaren gel's components. Not intended for use during pregnancy and lactation.